What does Contract Reward Modifier do? It allows you to customize the reward and penalty values for each contract and parameter type. You can limit the number of contracts of each type offered; or prevent any from appearing. All values can be set and modified through an in-game user interface. Does CRM support contracts from other addons? All contract and parameter types are accessed upon startup; any types from other addons will be detected. Contract Configurator contracts require some special handling and cannot be completely blocked, but are otherwise supported. Can values be set for each save file? Yes. Default values are set using the included config file (which can be changed and saved in-game), but any save file can set its own reward and penalty values; these will supercede values from the config file. I don't want another icon cluttering up the toolbar or an in-game interface, can this still be used? Yes. The toolbar icons can be completely removed (a field in the config file can be used to reset them); the values can be set in-game to your liking, then you can remove the toolbar icons. There is another option, only available in the config file, that will disable all save-specific settings. All values will be set entirely using the config file. 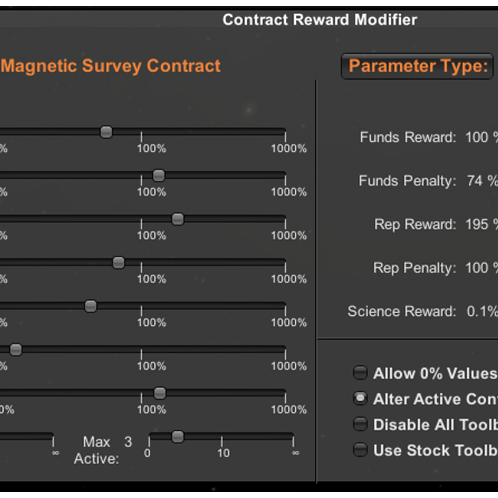 The Contract Reward Modifier window presents a set of sliders that allow for changes to all contract and parameter reward amounts, as well as several other options. At the top of the window are two drop down buttons that allow for the selection of different contract and parameter types. A special Global Settings selection is available for both Contract and Parameter Types. Values can be set with the sliders under the global settings; these will be applied to all Contract/Parameter Types after pushing the Apply To All button. All addon contract and parameter types should be available here. Contract Configurator types are pushed to the bottom of the list to avoid any potential spoilers revealed by contract names. The sliders below control the amount given for each different reward and penalty type. Strategy values are not directly affected by these sliders, i.e. setting science to 0.1% won't affect the science rewards given while using the science strategy. The sliders are half-way log-scale; the left half of the slider allows for 0.1 - 100% of the original value, while the right half allows for 100-1000% of the original. Contract duration can be adjusted from 10-1000%, but will only affect newly offered contracts. The maximum number of offered and active contracts of a type can be specified; any contracts beyond this amount will be rejected when the system tries to offer new contracts. All Contract Configurator contracts are can only be set to allow 1 or more contracts to be offered. By default the values only go down to 0.1%; there is an option to allow for nearly 0% (0.00000001%) using the Allow 0% Values toggle. Using this may cause odd rounding errors and prevent further adjustments from being made to any active contracts/parameters of that type. A toggle option is available to Alter Active Contracts as well as newly offered contracts. Turning this on and off while adjusting values may cause problems with reward values. Be default it is off; but you should stick with either turning it on, or leaving it off; don't go back and forth. There is also toggle to completely Disable All Toolbars. This can be used if you have set the values you want and don't need the toolbar icon taking up space. Toolbars can be re-enabled by changing the disableToolbar field to True at the top of the config file. If Blizzy78's Toolbar is installed you can switch between it and the stock app launcher using the Use Stock Toolbar toggle. Contract/Parameter amounts can be reverted to the default values set in your config file using the Reset Values button. The current values can be saved to the global config file in your GameData folder using the Save To Config button. Values saved to the config file will serve as the default for current save games. New save files (or save files that haven't been loaded while Contract Reward Modifier has been installed) will set all contract and parameter values using the config file settings. The config file-only disableSaveSpecificValues field allows you to bypass any values set in your save files; all values stored in the save files will be deleted.